Full access to eMetrics Summit, Predictive Analytics World for Business, Predictive Analytics World for Healthcare & Predictive Analytics World for Financial plus 2 full day workshops of your choice. Includes access to the joint Exhibit Hall and all networking activities. Full access to eMetrics Summit & one of Predictive Analytics World for Business, Predictive Analytics World for Healthcare OR Predictive Analytics World for Financial (2 day conference & 2 full day workshops of your choice). Includes access to the joint Exhibit Hall and all networking activities. 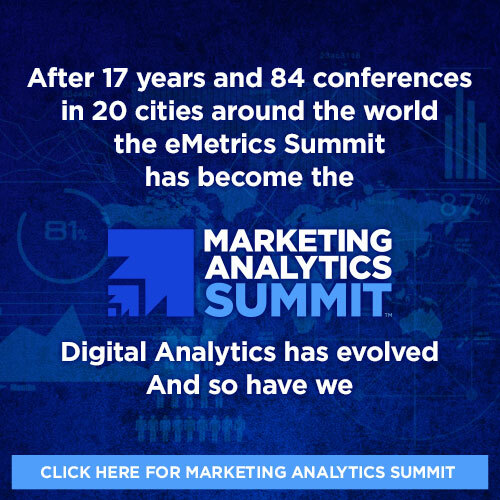 Full access to eMetrics Summit & 2 full day workshops of your choice. Also includes access to the joint Exhibit Hall and all networking activities. Access to the eMetric Summit, Predictive Analytics World for Business, Predictive Analytics World for Healthcare & Predictive Analytics World for Financial, as well as the joint Exhibit Hall and all networking activities. Access to the eMetric Summit & one of Predictive Analytics World for Business, Predictive Analytics World for Healthcare or Predictive Analytics World for Financial, as well as the joint Exhibit Hall and all networking activities. Pricing as 2 Day Package Options above plus the cost of the Workshop as below. Sunday, 10/29 – Option to only register for your choice of eMetrics Summit Workshop(s). 2 Full Day Workshops included with All Access Passes. Wednesday, 11/1 – Option to only register for your choice of eMetrics Summit Workshop(s). 2 Full Day Workshops included with All Access Passes. * Each additional attendee from the same company, registered at the same time, receives an extra $200 off the Four Day, Two Day or Plus Pass Options. Payment in full for Super Early Bird and Early Bird registrations must be received within two weeks of the cut-off date for that price point. Payment for all other registrations must be received in full at least one week prior to the Conference. If you intend to pay by purchase order, it must be authorized by Rising Media in advance. Attendee substitutions are permitted without charge. Cancellations made on or prior to Friday, September 15, 2017 will incur a cancellation fee of $150. No refunds will be made for cancellations made after Friday, September 15, 2017. If for reasons of Force Majeure the Event cannot take place as scheduled the Organizer reserves the right to reschedule the Event to a date and place of its choosing.